This charming beach house will be sure to become a summer tradition for your family. 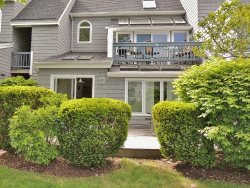 This home offers endless amenities, including a wonderful front porch with seating to enjoy the beautiful ocean views. Looking for a little more privacy? This 3 bedroom, 2 bathroom home offers a private big backyard equipped with ample outdoor furniture, fabulous ocean views and secluded beach access to a much less congested part of the beautiful 7 mile stretch of sandy beach. This vacation home offers a gorgeous kitchen for home cooked meals equipped with all the necessities and more, including a full size refrigerator with ice maker, dishwasher, lobster pot, blender, the list goes on and on. The kitchen perfectly positioned leading onto the amazing back deck for easy entertaining. A separate dining room and living room with all the beach cottage charm you could ask for are also provided in this beautiful home, not to mention the spectacular ocean views. All three beautifully decorated bedrooms are located upstairs with the full sized bathroom upstairs as well and the ¾ bathroom downstairs. We understand that sometimes you can`t always get away from work for a full week so feel free to stay connected with the complimentary high speed Wireless Internet offered. Other amenities that might make your vacation a little more comfortable (and packing a bit lighter) linens and towels are provided for your convenience for all of the beds, all you have to bring are your favorite beach towels and only a few as a washer/dryer and outdoor clothesline are included. Two A/C wall units are provided, one in each bedroom with the double beds, and multiple portable fans for your convenience, iron and ironing board and fully stocked kitchen with all the cookware, pots/pans, and appliances you could ask for. A gas grill is provided outside as well as an outdoor shower with hot and cold water, perfect for rinsing off after a long day at the beach…which is only 100 feet away! On street parking is available and is often conveniently available right across the street from this cottage if not a nearby street! Please note that the caretakers of the property do live next door in the attached apartment. There is a separate entrance and a separate yard area so you still have that single family home feel! And if you are looking for your home away from home and can’t possibly leave your four legged friend for your family vacation, pets are welcome at this adorable beach cottage with prior approval. Bedroom #1: 1 Double; Bedroom #2: 1 Double; Bedroom #3: 2 Twins. There is also one twin sized cot available in one of the double bed bedrooms if needed. 2. Dogs need to be supervised day and night. 3. Please clean up after your dogs. 4. The owner's dog will also have supervised access to the fenced in yard for exercise. Also, please note linens and towels ARE provided at 36 Main Avenue in Camp Ellis!